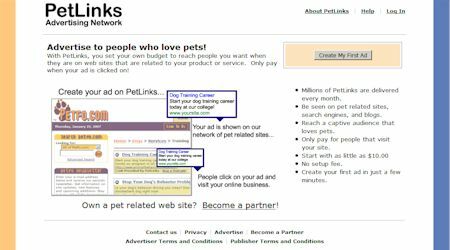 Founded in 2002 as a spin-off from its sister network, PetLinkeXchange, the PetLinks Advertising Network quickly became the largest advertising network for the Pet Industry. With millions of highly targeted advertisements delivered every month, publishers are able to monetize their sites easily while advertisers are able to deliver their marketing efforts on publisher sites that match specific targets. The key goal was to make it easy for new advertisers and publishers to get started. Take, for example, the ease of creating your first advertisement - an advertiser can build and target their first advertising message in less than five minutes.